Sgraffito has it's roots in the Italian language. It is a technique either of wall decor, produced by applying layers of plaster tinted in contrasting colours to a moistened surface, or in pottery, by applying to an unfired ceramic body two successive layers of contrasting slip or glaze. 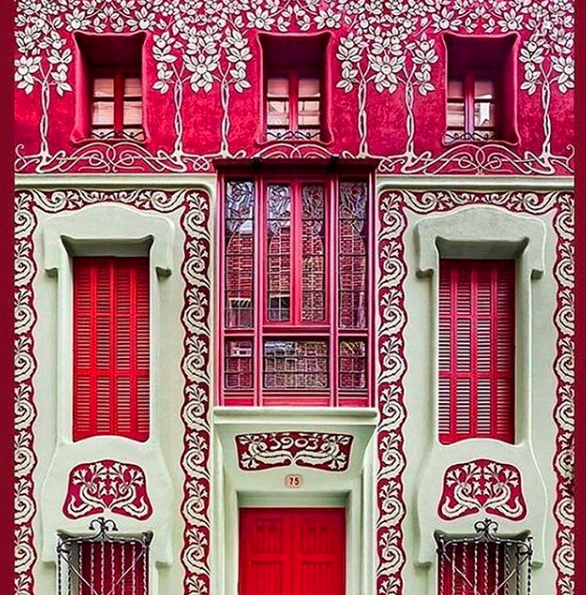 The cover image shows a Sgraffito building in Barcelona, built in 1903. Situated at 75 Padua Street, it was designed by Catalan architect Jeroni Granell. One of many Art Nouveau buildings in Barcelona by emminent architects including Gaudi and Sagnier, the work of Jeroni Granell has gone largely unnoticed. Kate Russell creates her own modern interpretation of the Sgraffito techniques in a collection of pottery. I have been admiring her beautiful ceramics which have a touch of folk art to them, remeniscent of times gone by and I love the way her technique is effective in both decorative and illustrative work.